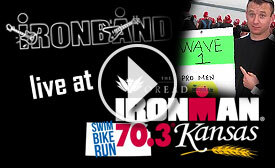 Ironband | Thank You Ironman 70.3 Kansas! A big thanks the 2014 Oread Ironman 70.3 Kansas, Ryan Robinson and his crew at Silverback, Ironman staff, Dave Downey and the Boulder Communications team as well as all the athletes, spectators and fans in Lawrence this weekend for the warm welcome as we performed at this event for the fifth consecutive time. 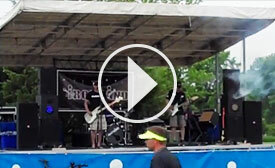 As always we had a great time and we loved being a part of the race from a musical perspective. It was great to see a number of faces that we haven’t seen in some time and meet several new ones. On the inspiring side of things, do you remember the song/video that we created (You Can Take Your Cutoff) about Chrissy Vasquez and her unwillingness to quit at last year’s event, even after her chip had been taken away? Well, she came back to Kansas this weekend and OFFICIALLY crossed that finish line prior time around – way to go Chrissy! Congratulations to the men’s champion, James Seear, and the women’s champion, Ruth Brennan Morrey, as well as all the overall winners and age-group winners. We had too many friends out there racing to mention them all so click here to view the full results for the 2014 Oread Ironman 70.3 Kansas.